Now a seasoned superhero, Peter Parker has been busy keeping crime off the streets as Spider-Man. Just as he's ready to focus on life as Peter, a new villain threatens New York City. Faced with overwhelming odds and higher stakes, Spider-Man must rise up and be greater. 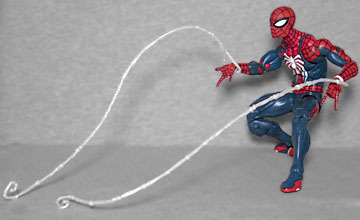 This Gamestop-exclusive figure, released under the "Gamerverse" banner, represents Spider-Man in the new Playstation 4 videogame. By all accounts, the game itself is excellent, even if it has a lot of open world busywork ("climb all these towers! collect all these backpacks! stop all these muggings! take all these pictures!") and not enough enough enemy variety; you get an amazing selection of suits and abilities from across the history of Spider-Man, and a spectacular set of gadgets; why don't we get more baddies to use them on? Even that Sinister Six Five fight that served as the launch trailer is held back until the second half. But still, between this game and Dad of Boi, it's been a banner year for Playstation. This Spider-Man figure does not use the body you'd expect, the skinny one so many Spideys have used before him; rather, he gets the larger pec-hinge body, which has surprisingly only been used for one Spider-Man so far; and that wasn't even the real Spidey, it was 2099! Why did they use that mold for this figure? Well, maybe they wanted him to look more like a middle-aged adult than a young adult, or maybe it's supposed to represent the thickness of his costume. Or maybe they were just tired of using the skiny body all the time, and wanted some variety. Whatever, it's a good mold regardless. 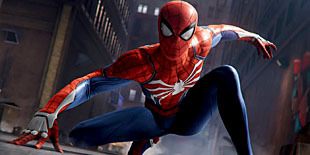 PS4 Spider-Man gets a new costume, dubbed the "Advanced Suit," seemingly for no reason other than "we wanted to make something marketable that we controlled." It's inspired by sneakers and athletic wear, and some actual thought went into it (which is more than we can say for some "just because we could" redesigns): the blue sections are the most flexible, the red parts are protective (so he doesn't get all cut up if he scrapes himself while swinging past a building), and the white parts are armored. Of course, everything is just painted here, not sculpted, but at least the design team had some reasoning behind the change. 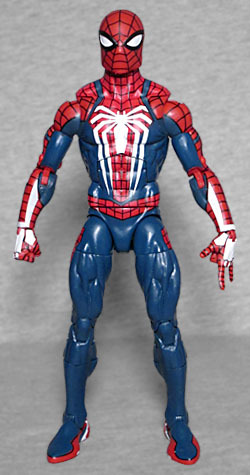 Since the Spider-Man 2099 head wouldn't work for this costume, the toy instead reuses the head from Spider-UK. Its thicker build and large jaw mesh well with the size of the body. And the way it's painted succeeds in making it look slightly different! Spider-UK's eyes seemed "squinty," because the raised edge of the outline around the eyes was painted black, while here it's white; that makes the lenses just minorly larger, but it's enough to alter the look a tad. Spider-Man moves at the head, neck, pecs, shoulders, biceps, elbows, wrists, torso, waist, hips, thighs, knees, shins, and ankles. If Hasbro had to pick a bigger body for this figure, it was the right one - the pectoral joints give him the extra poseability that a Spider-Man deserves. You get your choice of fists or thwipping hands (for all your Spider-Selfie needs), and while there's no BAF, we do get some accessories: the webs from the Amazing Spider-Man figure. Not something we needed, but not something we'll complain about. Since this figure is not part of the regular Marvel Legends lineup, it doesn't come in the regular Marvel Legends packaging. Rather, it gets the white Gamerverse style, which will absolutely make it stand out in a collection. Before you pull the figure out and toss it in the recycling. Interestingly, rather than a clear window glued to the box, the plastic tray has a cover that slides out with it. Is that something unique to this release, or will we be seeing it in the regular ML soon as well? Pointless costume change aside, the PS4 Spider-Man game is great - especially the job it does of introducing and using Mr. Negative (a character most people have never even heard of) as a villain, fleshing him out and making him an interesting enemy to duke it out with. 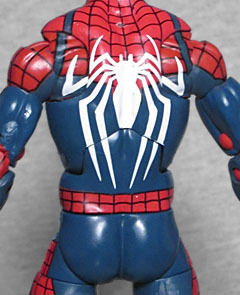 Now that we've got this exclusive Spidey, Hasbro needs to use their "suit" body to make a Mr. Negative to go with him.